The event is unclipped so we get to watch the show in all its original glory. We start off with two wrestlers that I am sure everyone reading this is familar with. Kana needs no introduction, at the time of the show she was mainly a NEO wrestler that hadn’t won any titles yet in her career but was getting more popular by the day. Hiroyo Matsumoto was a Freelancer in 2009 the same as she is today, wrestling regularly in NEO and Ice Ribbon. This may be the best match of the night. Matsumoto won’t shake Kana’s hand so Kana elbows her instead, Kana drops Matsumoto into the corner and hits a running hip attack to her back. Matsumoto fights back and stomps Kana but Kana connects with a series of kicks to Matsumoto’s ribs. Lariat by Matsumoto and she throws Kana into the corner, Matsumoto goes for a sleeper but Kana rolls out of it. Mounted slaps by Kana and she goes for an armbreaker, but Matsumoto rolls out of it and applies a side headlock. Matsomoto applies a reverse armbar but Kana gets to the ropes, scoop slam by Matsumoto and she hits an elbow drop. Camel Clutch by Matsumoto and she then applies a cross-legged submission before elbowing Kana in the back. Kana elbows Matsumoto into the corner and hits a hip attack, sleeper by Kana and she gets the cross armbreaker applied, but Matsumoto gets a toe on the ropes. Dropkick by Kana but Matsumoto returns fire with a lariat, Kana gets on the second turnbuckle but Matsumoto throws her off and puts her in a crab hold. Matsumoto picks up Kana and goes for a backbreaker, Kana slides away however and she dropkicks Matsumoto in the knee. Cross kneelock by Kana but Matsumoto gets into the ropes, kicks to the leg by Kana and she puts Matsumoto in an Indian Deathlock while slapping Matsumoto in the face. Ankle hold by Kana but Matsumoto gets into the ropes, Kana charges Matsumoto but Matsumoto catches her with a sidewalk slam. Matsumoto gets on the second turnbuckle and hits a missile dropkick, cover by Matsumoto but it gets two. Elbow by Matsumoto but Kana slaps her as they exchange blows, Kana wins the battle and she follows with a release German. Matsumoto replies with an elbow smash, both wrestlers slowly get up and trade elbow strikes. Matsumoto elbows Kana into the corner and hits a body avalanche, cover by Matsumoto but it gets two. Matsumoto gets Kana on her shoulders but Kana rolls off and applies an ankle hold. Matsumoto gets to the ropes again, kicks to the leg by Kana but Matsumoto catches one and pushes her off. Roaring elbow by Matsumoto, she picks up Kana and delivers a gutbuster for two. Kick to the gut by Kana and she kicks Matsumoto hard in the head, but Matsumoto gets a foot on the ropes when she covers her. Elbow by Matsumoto and she drops Kana on her head with a backdrop suplex, she covers Kana but the bell rings, as time as expired. The match is a Draw. Two more names that everyone should be familar with as both still actively wrestle. Back in 2009, Emi Sakura was the leader and trainer of the promotion Ice Ribbon, which was her home base until she left the promotion in 2012. Arisa Nakajima was in her third year at the time of the match and still had the cute wrestling attire as she hadn’t stepped up her game yet. She had already won two Jr. Championships in JWP however and was seen as a future star of the promotion. Sakura attacks Nakajima before introductions with a dropkick, quick sunset flip by Sakura but it gets a two count. Nakajima slaps Sakura but Sakura rolls her up again, she gets on the second turnbuckle but Nakajima joins her. Sakura slides under Nakajima and hits a powerbomb, she picks up Nakajima but Nakajima hits a DDT. Dropkick by Nakajima, she goes off the ropes but Sakura avoids her charge and hits a jumping kick from the second turnbuckle. Crossbody by Sakura into the corner and they go into a strike exchange, which Sakura gets the better of. Sakura swings Nakajima to the mat by her hair, drop toehold by Sakura and she rolls over Nakajima’s back before applying a STF. Nakajima inches to the ropes to force a break, hard elbow by Nakajima and she hits a double underhook suplex. Mounted elbows and slaps by Nakajima and she hits a Tornado DDT. Diving roll-up by Nakajima, but Sakura gets a shoulder up. Nakajima goes for a suplex but Sakura blocks it and elbows Nakajima to the mat. Sakura sits Nakajima on the second turnbuckle and joins her, but Nakajima elbows her off and hits a missile dropkick. Nakajima waits for Sakura to get up but she doesn’t, Nakajima picks her up and slams Sakura before going up top, but Sakura gets her feet up so Nakajima jumps over her. Stomps by Nakajima in the corner, Sakura goes for a swinging neckbreaker but Nakajima blocks it and applies a sleeper. German suplex hold by Nakajima, but Sakura gets a shoulder up. Nakajima goes up top and hits a diving footstomp, but again Sakura kicks out of the pin. Nakajima picks up Sakura and goes off the ropes, but Sakura catches her with a backslide for two. Sakura quickly puts Nakajima in La Magistral, and she picks up the three count! Emi Sakura wins the match. A difficult match to really get a cohesive opinion on. The action was all fine and I loved the amount of fire that Nakajima showed, she was the one acting like the grumpy veteran even if she was dressed like a school girl. But Sakura’s methodology didn’t seem to fit as she actually was the seasoned veteran but was mostly being slightly silly or going for flash pins. It felt like they had a role reversal. It was also short at under seven minutes, and it felt like it ended a bit suddenly as Sakura hadn’t done any real damage to Nakajima. The match is watchable due to Nakajima’s offense, but it felt too off to really recommend. Now this is a unique group of individuals. Uematsu was a Freelancer fresh off getting a big win over Devil Masami in her Retirement Match, she was set to get a nice push in theory but wrestled in so many different promotions that most of her success was just in the tag team division in JWP. Io Shirai currently is the Ace of Stardom and one of the best wrestlers in the world, but back in early 2009 she was a mid-card level Freelancer that had yet to win a title in any promotion. Hotta was the veteran of the group as she debuted back in 1985, she wrestled in a number of promotions as a Freelancer such as JWP and LLPW-X. Finally, Natsuki Taiyo is the second Passion Red wrestler to make an appearance tonight, she was a regular NEO wrestler who was still early in her career. After they goof around with Toshie as Io wants to have fun with Taiyo and Hotta, things settle with Io and Hotta as the first two legal wrestlers. Io tries to dropkick Hotta with no luck, elbows by Io but Hotta grabs her arms and makes her form the Passion Red sign. Toshie runs in and boots Hotta to the mat, Taiyo comes in and she is double teamed in the corner. Taiyo takes back over with dropkicks and tags in Hotta, Io tries to fight back but Hotta doesn’t budge. Crab hold by Hotta to Io but Toshie breaks it up, Hotta elbows Toshie into the corner as Io goes for a roll-up, but Hotta reverses it into a cross armbreaker. Hotta tags Taiyo, wristlock by Taiyo to Io but Io throws Taiyo into the corner and hits a dropkick. Io tags in Toshie, Toshie throws down Taiyo by her hair and hits a running boot in the corner. Toshie picks up Taiyo, Toshie goes for lariats but Taiyo ducks it and hits a springboard crossbody for a two count. She tags Hotta back in, Hotta kicks Toshie in the back but Toshie dropkicks her in the head. Io comes in the ring to help Toshie with Hotta, Taiyo comes in too but Io hits Hotta with a Space Rolling Elbow in the corner. She goes for another one but Hotta catches her, Io takes Hotta to the mat and applies a crossface, but Taiyo breaks it up. Code Breaker by Io to Hotta and she applies an armtrap crossface, but Hotta gets into the ropes. Io goes off the ropes but Hotta hits a hard elbow, Hotta tags in Taiyo and Taiyo hits a diving body press for two. Taiyo and Io trade elbows, they go back and forth with Taiyo winning the sequence with a dropkick. Toshie flies in the ring with a missile dropkick, quebrada by Io to Taiyo but it only gets two. Io goes up top but Hotta grabs her, Taiyo joins Io and hits an avalanche armdrag. Taiyo goes for an Iguchi Bomb but Io reverses it with a hurricanrana, Tiger Feint Kick by Io and she hits a side Russian leg sweep for a two count. Io slams Taiyo in front of the corner, she goes up top but Taiyo avoids the body press. Triple Taiyo☆Chan La Magistral by Taiyo, she picks up Io and nails the Iguchi Bomb, the Io barely gets a shoulder up. Taiyo goes for a kick but Io ducks it, Hotta runs in and hits Io, Taiyo-chan☆Bomb by Taiyo and she gets the three count! Hotta and Taiyo are your winners. What a special little random match, well at least it feels special now since Fuka has been retired for so long. Fuka was one of the most successful wrestlers out of JdStar’s “Athtress” initiative, which was their attempt to find ‘Idols’ that would bridge the gap between modeling/acting and wrestling. It generally failed, but it gave us Fuka so we are thankful for that. Fuka wrestling in various smaller promotions including her own promoted shows after JDStar folded in 2007, maintaining her popularity. Ray was also a Freelancer that mostly wrestled in IBUKI and NEO, although at this stage of her career she still had no title wins. So Fuka is definitely the bigger star here, but Ray was a five year veteran so was far from a push-over. Ray and Fuka circled each other as both were slow to engage, Fuka takes Ray to the mat and applies a kneelock. Ray quickly gets out of it but Fuka takes her back down and goes for a cross armbreaker, but Ray gets out of it and goes for a Kimura. Sleeper attempt by Ray but Fuka blocks it and they end up in the ropes again. Ray stomps on Fuka and kicks her in the back, but Fuka returns the favor and hits a spinning headscissors. Tiger Feint Kick by Fuka and she goes for the armbreaker again, Ray blocks it so Fuka applies a triangle choke instead. Ray escapes it and puts Fuka in a crab hold, Fuka gets to the ropes and blocks Ray’s next submission attempt before putting her in an ankle hold. Ray gets out of it and dropkicks Fuka, she picks Fuka back up and chops her down into the corner. Irish whip by Ray and she hits a Space Rolling Elbow followed by a Stunner for a two count. Fuka knees Ray in the chest, she picks her up but Ray blocks the Fisherman Buster. Heel Drop by Fuka and she hits a Fisherman Suplex for a two count cover. Fuka goes off the ropes but Ray avoids her dropkick attempt and hits a jumping kick to the head. Cartwheel powerbomb by Ray, but Fuka kicks out of the cover. Ray goes up top but Fuka kicks her from behind, Fuka joins Ray but Ray pushes her off and hits a missile dropkick. Ray picks up Fuka and hits German Suplex Hold, picking up a two count. Ray goes up top but Fuka avoids the moonsault attempt, Gannosuke Clutch by Fuka but it gets two. Ray and Fuka trade elbows before trading kicks, high kick by Fuka but Ray kicks her in the face back and covers her for two. Ray goes off the ropes and kicks Fuka in the head again, she picks up Fuka but Fuka kicks her as she does so and hits a release German suplex. Inside Cradle by Fuka, she charges Ray and hits a jumping knee. Doll F by Fuka, and she gets the three count! Fuka wins the match. Time for Passion Red vs. Meiko Satomura and her Sendai Girls’ babies. Takahashi makes her first appearance of the night, she by far was the most accomplished wrestler in Passion Red as she had a slew of title runs in her career and was one of the biggest stars in NEO. Meiko Satomura of course is the legendary owner who was a big star in GAEA before starting her own promotion in 2006. Mizunami debuted in 2004 but started slow (plus she missed all of 2006) and had won no titles in her career, today she is one of the top wrestlers in Pro Wrestling WAVE. Chisako is in a similar boat, she debuted in 2006 and was still working her way up the card as well. Mizunami and Chisako were two of Satomura’s top home grown wrestlers, so this was their chance to show off a bit against three of the most popular Freelancers in Joshi. Taiyo and Chisako start the match for their teams, Taiyo elbows Chisako into the ropes but gives her a clean break. They trade wristlocks, Irish whip by Chisako but Taiyo trips her and runs over her back. Kana and Takahashi come in the ring and all three dropkick Chisako, Taiyo tags in Kana and Kana kicks Chisako repeatedly. Chisako fires back with a trio of dropkicks before tagging in Mizunami, Kana has recovered and the pair trade strikes. Dropkick to the knee by Mizunami and she hits a leg drop onto Kana’s head, picking up a two count. Kicks to the chest by Kana and she knees Mizunami into the corner so she can tag Takahashi. Deep chinlock by Takahashi but Mizunami gets out of it and applies a hammerlock. Takahashi gets out of that and knees Mizunami, Irish whip by Takahashi and the two collide with neither budging. Elbows by Mizunami but Takahashi shoulderblocks her to the mat, another shoulderblock in the corner by Takahashi but Mizunami floors her with a shoulderblock of her own. She tags in Satomura, Satomura locks knuckles with Takahashi and she wins the battle as she pushes Takahashi to the mat. Kicks by Satomura but Takahashi hits a sidewalk slam, picking up two. She tags in Taiyo, dropkicks by Taiyo but Satomura elbows her hard in the head. Kicks by Satomura, Chisako tags in and she dropkicks Taiyo in the corner before hitting a face crusher. More dropkicks by Chisako, and she covers Taiyo for a two count. Taiyo slides under Chisako’s lariat attempt, they trade dropkick attempts before both go for flash pins. Chisako dropkicks Taiyo into the corner but Taiyo avoids her charge and drop toeholds her into the turnbuckles. Kana runs in and hits a hip attack, neckbreaker by Kana and Taiyo dropkicks Chisako in the face. Chisako recovers and trades elbows with Taiyo, Taiyo tries running up the corner but she trips, allowing Chisako to hit a neckbreaker. Chisako tags Mizunami, scoop slam by Mizunami and she hits a pair of leg drops. A crucifix pin by Taiyo only gets two, she goes off the ropes and rolls up Mizunami for another two count. Taiyo successfully runs up the corner this time and hits a crossbody, giving her time to tag in Kana. Kicks by Kana but Mizunami slams her back into the corner, Mizunami goes up top and she hits a diving shoulderblock for two. Mizunami picks up Kana but Kana slides away, hip attack by Kana and she hits a Reverse DDT for two. Kana waits for Mizunami to get up and hits a running hip attack, cover by Kana but it gets broken up. Kana picks up Mizunami and hits a Buzzsaw Kick, but she nudges her to her own corner so Satomura can tag in. Satomura does so, hip attack by Kana to Satomura and they trade leg kicks. Satomura wins the kick battle, jumping elbow by Satomura in the corner but Kana slaps her. Kick to the gut by Kana and she hits a German suplex hold, picking up two. Seated Armbar by Kana, she tags in Takahashi but Satomura gets away from Takahashi and they trade elbows. Pele Kick by Satomura, she picks up Takahashi but Takahashi drops her on her head with a backdrop suplex. Lariat by Takahashi but Satomura elbows her to the mat, backdrop suplex by Satomura but Takahashi springs up from it and goes for a jumping kick. Satomura ducks it and hits a Death Valley Bomb, but it only gets two. Satomura goes for the Scorpio Rising but Takahashi blocks it and connects with a sliding kick for two. Uppercut by Satomura and she hits the cartwheel kneedrop, she tags in Chisako and Chisako comes in the ring with a missile dropkick. Cutter by Chisako, she picks up Takahashi but Takahashi hits a backdrop suplex. Takahashi goes for a Reverse Splash but Chisako moves, Mizunami and Satomura run in as Takahashi is triple teamed in the corner. Inside cradle by Chisako, but Takahashi kicks out. Enzuigiri by Takahashi, Taiyo and Kana come in so they can go for the Triple Powerbomb, but Satomura and Mizunami run in to prevent it. Hurricanrana by Chisako to Takahashi, kick to the head by Satomura and Mizunami hits a leg drop. Chisako goes up top and hits the diving body press, but Takahashi barely kicks out. Chisako goes up top again but Kana grabs her, Takahashi joins Chisako up top and she hits the superplex. Slaps by Takahashi and she hits a scoop pickup into a Stunner, but Mizunami breaks up the pin. Taiyo picks up Chisako in an Iguchi Bomb while Kana and Takahashi hit lariats off the second turnbuckle as she is hitting the move, Takahashi follows with the Nana☆Racka and she picks up the three count! Passion Red wins! 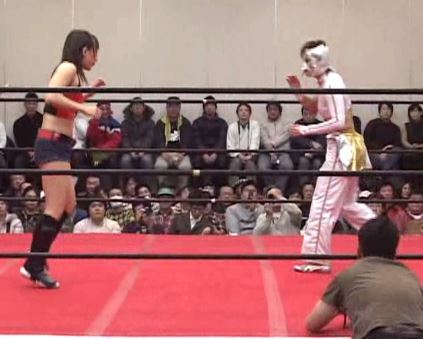 When Arisa Nakajima vs. Emi Sakura is the worst match on a card, you know you have something special. This event was loaded with talented wrestlers, with no filler at all like most wrestling events have. 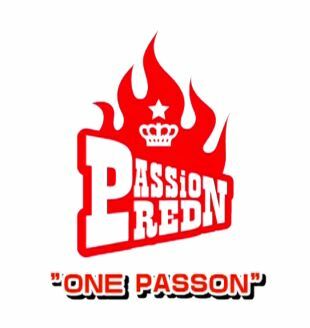 The opener was the best match of the night but several other matches were high quality as well, with Passion Red really stepping it up to make their first event a success. Its no surprise that Kana and Taiyo’s rise in popularity continued as even in 2009 you could tell they were destined for greater things. Overall one of the better self-promoted shows I have seen, can’t go wrong with any of the matches on this event.